by Jaina Mishra – Wovensouls. 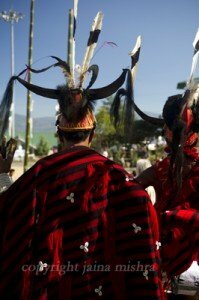 Nagaland – a state in North East India – is home to sixteen of the twenty-plus Naga warrior tribes that reside in the region between the Brahmaputra plains in India and the Chindwin valley in Myanmar. 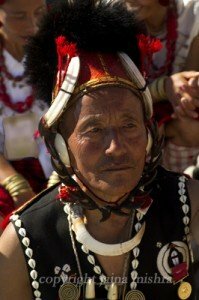 While the various Naga tribes differ greatly from each other, they also share some very interesting characteristics. Traditionally, the tribes lived within their own clans in small villages, separated from each other by heavily forested hills. 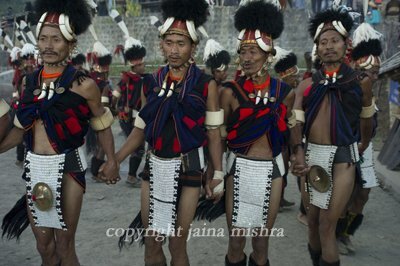 Although the tribal clans were divided by their ideologies, they all faced common life issues i.e. threats from wild life and from other tribes. As a result, hunting – of animals and rival humans – emerged as a common lifestyle across all the Naga tribes. 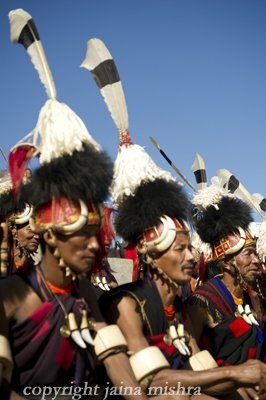 Warriors earned their status within their tribe by slaying the enemy and were allowed to wear symbolic declarations of their victory on their costumes. Skulls, bison bone, wild boar tusks, tiger claws and tiger teeth were common costume embellishments in the past. Today some of these practices have become extinct and so only family heirloom pieces are worn. 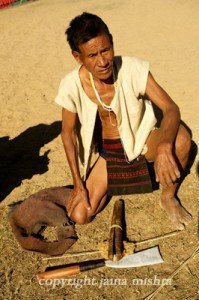 Besides declaring victory in wars, a textile may also announce the wearer’s record of participation in raids, his history of offering feasts of merit, his wealth, his clan, his seniority within the clan and his place within the family. Each tribe expresses its unique identity in many ways but the most striking signatures are their costumes and their extravagant beaded jewelry. Motifs, designs, costume formats, and minor colors vary significantly and it is easy for a complete outsider to spot the differences. 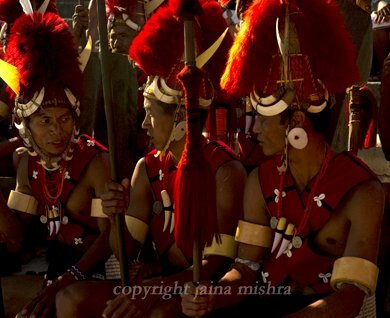 But in spite of all the differences, the striking commonality across the tribes is the dominant use of red, white and black. 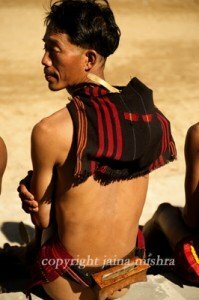 Even in the barely clad tribes, these colors appear in the rudimentary forms of textile they wear on their bodies. 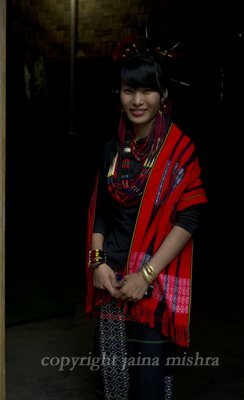 Broad bold stripes along with minimal geometric motifs are a characteristic of most Naga textiles. Double ply yarn of cotton and nettle fibre, is used to create the thick Naga fabric. The back strap loin loom is made using rods of bamboo and sago palm and the strap itself is made of plaited cane. A sword is used for beating the warp. Red dye is considered harmful for the young, hence only older women dye thread red. 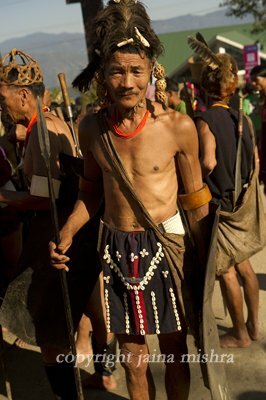 These are probably just a few of the intriguing customs that form the cultural placenta for the creation of all the wonderful Naga costume articles. 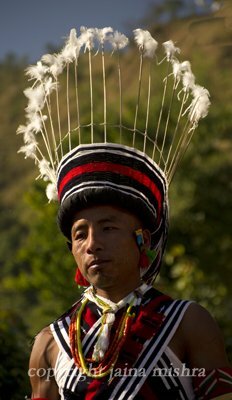 Multiply the number of traditional signature articles – shawls, head gear, loin cloths, mekhlas, sarongs, kilts, sashes, shoulder bags and of course beaded jewelry – with the number of distinct Naga tribes and we come up with a staggering number! 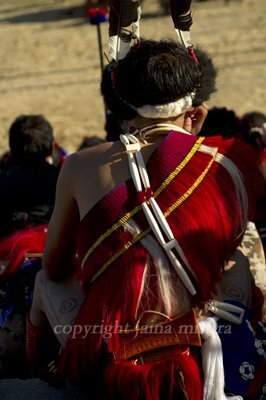 For the eyes to discover all of these cultural Naga articles, for the mind to unearth all the cultural stories that go into their creation and finally for the soul to drink in all the beauty will probably take several more lifetimes than it will take for all of that culture to disappear!